Ahhh, Friday. Time to break from the stress of work and concentrate on growing moustaches. 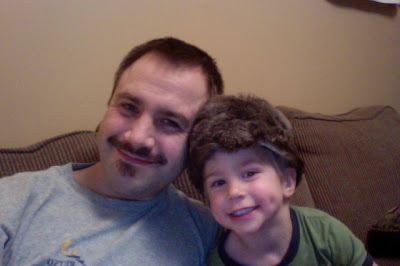 My son decided to join today's Movember picture while wearing a racoon hat. I wonder if I could get my stache as soft and fluffy as that hat? Anyway, I am over halfway through the month and I still haven't had an excuse to by some stache wax for shaping and/or moulding. Would be nice to try some sort of braid as well, unfortunately this month is not long enough for that. I can't believe how many students have stopped me in the hall and said, "nice moustache!". Fortunately I am poor at judging sarcasm, so I will assume that "sick moustache" means that it looks pretty fantastic.